What the Heck Is Gnudi? I thought I’d seen and made it all — rigatoni alla carbonara, lasagne di carciofi, crespelle alla fiorentina — you know, all the great Italian recipes. But right there in my new Italian cookbook was a recipe for gnudi. Gnudi? What?? A search through my memory banks brought no recollection of ever having heard of such a beast. What the heck is it and how have I missed it all these years? Memory lapse or culinary omission — no matter — it was an error to be rectified immediately. Hand rolled dumplings. 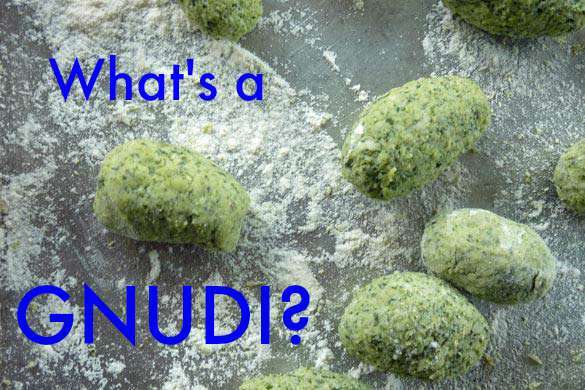 Gnudi translates to “naked” in Italian. Gnudi is basically naked ravioli; in other words, the yummy center tucked inside of a ravioli shell, but without the shell. Capisce? The teaspoon-sized cheese dumplings are made with fresh ricotta cheese and vegetables. The combinations are endless, but some of the more usual suspects are spinach, Swiss chard, zucchini and beets. I’m no gnudi expert, but they turned out pretty dang good. Pillow soft Swiss chard and ricotta dumplings make a fine vegetarian entree. The secret to successful gnudi is to use as little flour as possible — just enough to keep the dumpling intact. Veggie and cheese are the dominant flavors, not flour. Squeeze the ever-loving hell out of your veggies to remove the liquid and strain the cheese, even if it already looks dry. 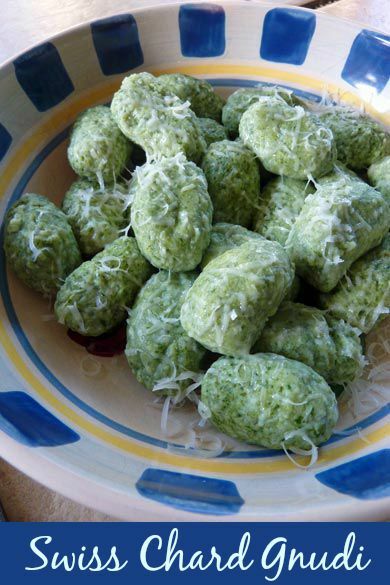 Gnudi are just plain fun and really easy to make. They’re much more forgiving then gnocchi (which can turn out dense and chewy) and way easier than rolling pasta. You don’t have to make your own cheese to create these soft little dumplings and gluten-free flour will work as well. One of the best things about learning to cook is that you will never run out of inspiration for your next kitchen experiment. There’ll always be some funky ingredient or unusual recipe that you have not yet tried.